To help celebrate Clara Rockmore's 105th birthday on March 9th, Google has produced an interactive Doodle that lets you play a few notes of The Swan. 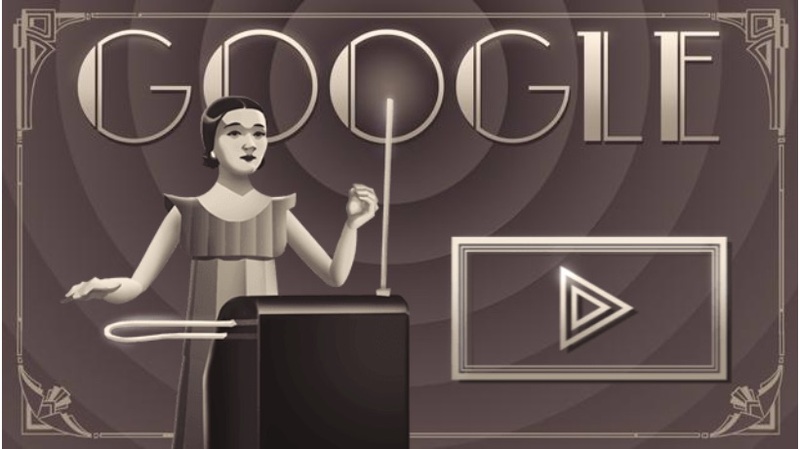 We're so grateful to Google for putting Clara Rockmore in the spotlight that we'll overlook the fact that the doodle has her playing as a left-handed thereminist and that they drew the volume antenna upside down. Or maybe we won't. Either way, when you consider how many people visit Google every day, it's not hard to imagine that hundreds of millions of people around the world will learn about this unique and extremely talented musician and her instrument of choice. Visitors to Google's search page can through a quick lesson on how to play the theremin and the first 5 notes of The Swan. After that, you're free to play with the doodle freestyle on a preset scale. Click the gear icon in the lower left to disable "easy mode" and play free form. You can also change the waveform and octave. The Clara Rockmore doodle was created in cooperation with the Nadia Reisenberg and Clara Rockmore Foundation by artist Robinson Wood, interaction designer Kevin Burke, and engineers Will Knowles and Kris Hom. More details about the origin of the doodle and the artists behind it are available at Google. The doodle is currently rolling out around the world as the date changes. If you don't see it yet, try visiting Google.co.jp or Google.co.nz.